In the Ambrosian Rite, the Third Sunday after Epiphany presents a nice example, one among many, of a text borrowed from the Byzantine liturgy. The Ambrosian corpus of Mass antiphons is much smaller than the Roman one, and many pieces are used on several Sundays over the course of the liturgical year. These are arranged in the antiphonary in a Common of Sundays, and sung in rotation. On the Sundays after the octave of Epiphany, however, an exception is made for the Transitorium, the equivalent of the Roman Communion, of which there are proper ones used only in that period, with particularly beautiful texts. On the Third Sunday, the transitorium is a Latin translation of a hymn sung on Christmas in the Byzantine Rite, composed by St Andrew of Crete, who was born in the mid-7th century; the year of his death is variously given as 712, 726 or 740. This is the first of a series of “stichera”, as they are called, texts sung between verses of the Laudate Psalms (148-149-150) towards the end of the longest (by far!) of the canonical Hours, Orthros. The Greek original, which does not include the phrase “the shepherds wonder at the star” found in the Latin version. 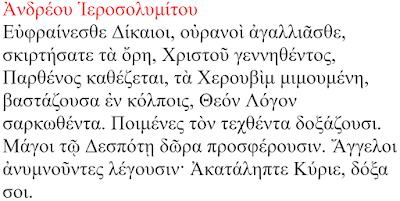 The texts of the other transitoria of the season after Epiphany are also very beautiful. IV after Epiphany Te laudamus, Domine omnipotens, qui sedes super Cherubim, et Seraphim, quem benedicunt Angeli, Archangeli, et laudant Prophetæ, et Apostoli. Te laudamus, Domine, orando, qui venisti peccata solvendo. Te deprecamur magnum Redemptorem, quem Pater misit ovium Pastorem. Tu es Christus Dominus Salvator, qui de Maria Virgine es natus. Hunc sacrosanctum Calicem sumentes, ab omni culpa libera nos semper. – We praise Thee, Lord Almighty, who sittest upon the Cherubim and Seraphim, whom the Angels and Archangels bless, and the Prophets and Apostles praise. We praise Thee, o Lord, in our prayer, who came to destroy (our) sins. We beseech the great Redeemer, whom the Faher sent as the shepherd of the sheep. Thou are Christ the Lord, the Savior, who wast born of the Virgin Mary. As we received this most holy Chalice, deliver us always from every sin. The Mass of the “Sixth Sunday after Epiphany” is always said on the Sunday before Septuagesima, and the transitorium reflects the beginning of the passage to the penitential season of Fore-Lent. VI after Epiphany Convertimini filii hominum, dum habetis tempus, dicit Dominus, et ego scribam nomina vestra in libro Patris mei, qui est in caelis. – Be converted, ye sons of men, while ye have time, saith the Lord, and I will write your names in the book of My Father who is in heaven. As always, thanks to Nicola de’ Grandi, who provided part of the material for this post.